Imagine this. You are traveling down the road at the proper speed, having kept up on your car’s maintenance when your check engine light comes on. Thinking it is nothing, you continue down the road for another mile or 2 when you suddenly begin to see smoke come out of you exhaust and your car immediately dies as you pull off to the side of the road. This is not an uncommon scenario and one that we here at Magic Valley Towing are used to hearing. Breakdowns can happen at any moment and they can be devastating if you are in a crunch for time. That is why you need to have a Gooding Towing Service that can be to you in a matter of minutes. We understand how frustrating it can be to be broken down on the roadway. That is why we are committed to being the quickest towing company in the Gooding area. Semi trucks often go through Gooding, making it a common place for truck malfunctions or highway collisions. There is no better towing service than us for big rigs and 5th wheelers that get in an accident on or around Goodings roads and highways. Our competent crew uses the best semi truck towing equipment available to quickly remove wreckage and make the road safe after an accident. 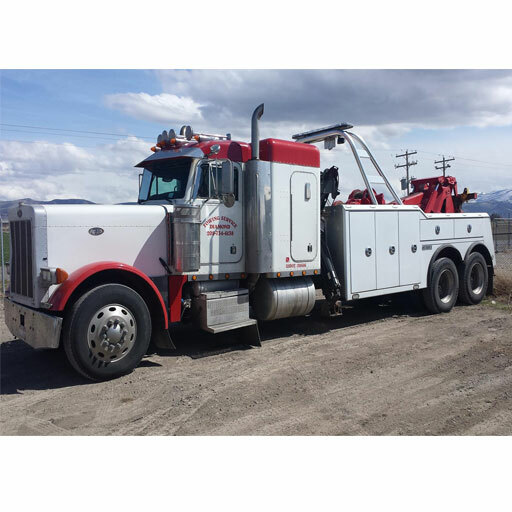 Any heavy wrecker who calls us to manage their tow job will be able to work with professionals in the industry. We have the knowledge and experience of working with big rig company insurance claims, and we can handle all of the paperwork to ensure that you and your big rig are cared for. Not only are we committed to offering the quickest service, but also the most reliable and safe. Cars are an important part of anyone’s life and unnecessary damage caused to your vehicle because of an unexperienced towing can be a very frustrating situation. That is why we pride ourselves on having been in the towing industry for over 15 years. We also have extensive training for our drivers to ensure that they understand the best practice in towing. So you can rest easy knowing that your vehicle is in qualified and capable hands. We are a AAA Certified Towing Service. That means that if you have AAA roadside insurance, you most likely won’t have to pay a dollar for you tow. AAA also holds us to higher standards has a provider, so we go even further for you to ensure that your experience with us is the best it can be in this difficult time. If for any reason you are not satisfied let us know and we’ll make it right. We make sure to go the extra mile for all of our customers. If you need a ride to a nearby hotel we can give you a lift. Just ask us for whatever you need and we’ll be happy to help within reason. No need to call a cab or a friend to come pick up! We pride ourselves on offering one of the best towing experiences in the Gooding area.